1934: A 99-foot 9-inch steel tower constructed by the CCC. August 4, 1931: "The erection of a 100-foot high steel forest fire observation tower near state highway number twenty, one mile east of Chadbourn has been completed. It is the 22nd unit in a proposed state-wide system of 125. 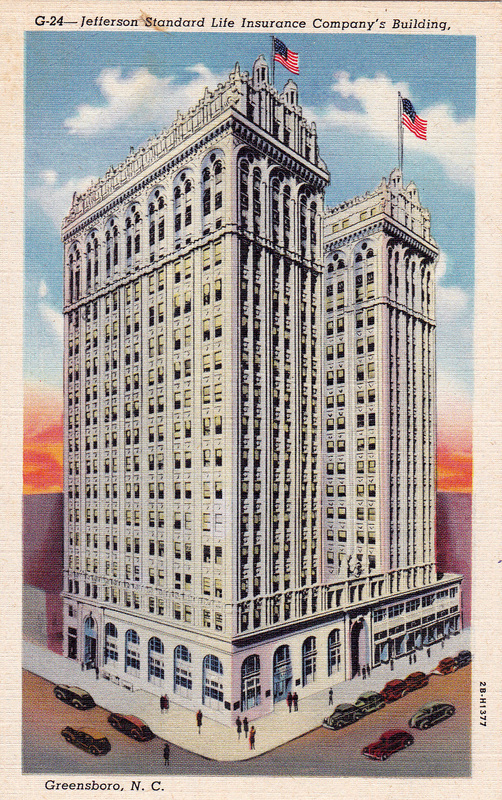 1934: A 45-foot 9-inch steel tower was erected by the CCC. 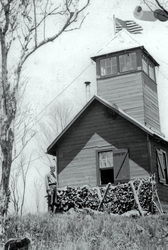 1937: A 120-foot wood tower was erected by the CCC. 1944: A 120-foot tower was erected. 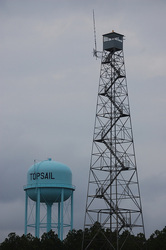 January 2014: Government auction for surplus property: the 99'9" steel tower and the nine-tenths of an acre the tower is located are being sold at auction. The closing date is January 28, 2014. The winning bid total, plus fees, was $8,922.50. 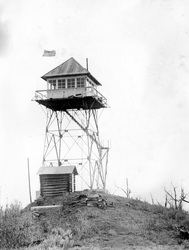 1934: A 59-foot 3-inch steel tower constructed by the CCC. 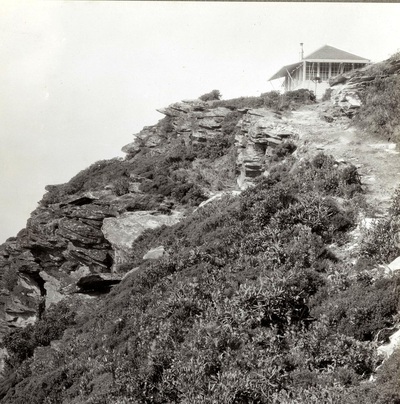 1936: The Civilian Conservation Corps erected a 99-foot 9-inch steel tower. April 20, 2013: A dedication ceremony, celebrating the restoration of the tower, was held at the Green Knob Fire Tower with speakers and featuring a tour of the tower. December 10, 1956: "S.Sgt. Pete Suteau of McGhee Tyson Air Force Base at Knoxville, Tenn., pilot of a light aircraft last heard from at 11:10 a.m. yesterday, was found uninjured at the Hazel Creek Fire Tower near here (Clingman Dome) today. A Civil Air Patrol message at 9:05 a.m. reported the sergeant was not injured. His plane apparently crashed in the Great Smoky Mountains. The message was received here from a Civil Air Patrol radio station set up last night near the top of this peak by two CAP officers, Lt. Harold Medford and Capt. 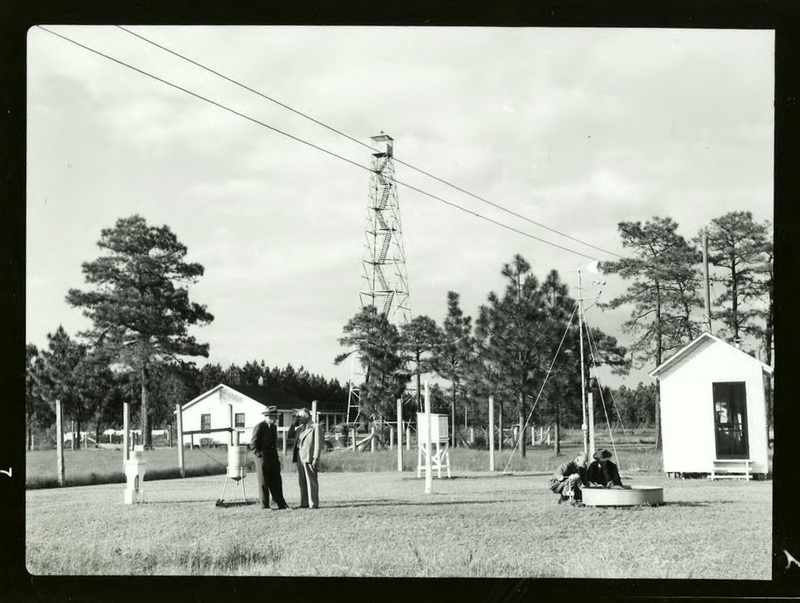 Howard Haskell, both of Shelby, N.C.
1934: A 59-foot 3-inch steel tower was erected by the CCC. October 12, 1954: "There's a tiny glass enclosed cubbyhole atop a 73-foot steel tower on Healing Springs mountain. In this cubbyhole there is a man, armed with field glasses and a two-way radio, who will help to save thousands of dollars for people of Davidson and surrounding Counties in the next few months. The tower, known as the 'High Rock Tower,' although on Healing Springs mountain, is the first forest fire spotting tower ever erected in Davidson County. Work on the structure started over five weeks ago, but still isn't quite complete. However, the tower was placed in service several days ago because of the extremely dangerous fire situation existing in this area, and it has already proved its value. 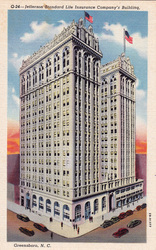 The tower was built by Wagner Construction Company, of Salisbury. It took much longer to build than expected, because of the difficulty in blasting hard rock at the base to set up a foundation. It is located on property belonging to J.M. Daniel estate. The property has been leased, along with property over which the road winds, as well as that covered by a power line leading to the tower. 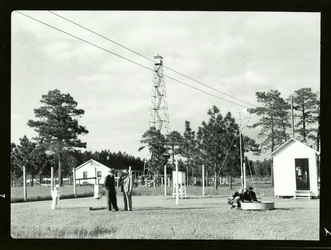 1934: A 86-foot 3-inch steel tower erected by the CCC. 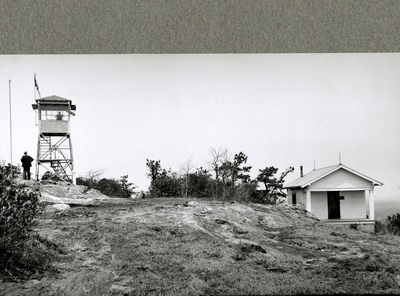 September 14, 1951: (Caption with photos) "Fire Watcher-- Five towers have been erected around Camp Lejuene Marine Base where alert watchers are kept on duty to guard against forest fires. Use of live ammunition creates a fire hazard in the adjacent North Carolina woodlands and the Marines are provided to check a blaze at the first alarm. July 1934: The Civilian Conservation Corps erected a 79-foot 6-inch steel tower. 1934: A 72-foot 9-inch steel tower constructed by the CCC. 1931: 80-foot tower was erected. November 2005: Staffing of this tower was discontinued. 1940: A 40-foot steel tower with observation cab was erected by the Civilian Conservation Corps. April 23, 1952: "A woman lookout in a forest fire tower at Roaring Gap died from a fall down the steps of the 59-foot steel structure yesterday. 1934: A 72-foot 9-inch steel tower was constructed by the CCC. 1934: A 99-foot 9-inch steel tower erected by the CCC. 1934: A 60-foot steel International-Derrick tower was erected. 1934: A 86-foot 3-inch steel tower constructed by the CCC. 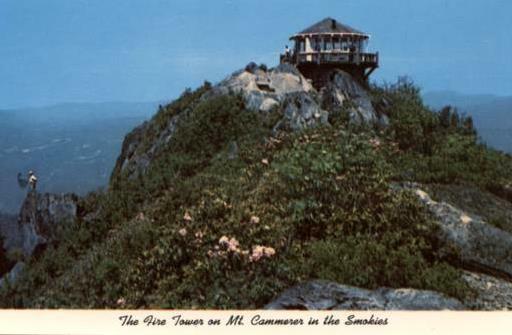 February 17, 1967: "County Ranger Yates Smith is looking for employees to man the fire tower on Spencer Mountain so that it can be in operation year-round. 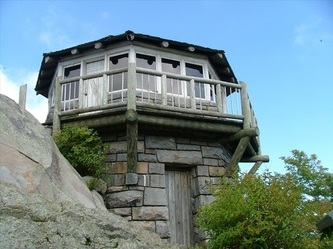 The tower, which used to operate year-round, has only been operated three months in the spring and three months in the summer for the past year, Smith said, because of the lack of personnel to man the tower. 1953: A 120-foot Aermotor steel tower was erected to replaced the earlier wood tower. 2009: In the spring the tower was offered for sale by a private party. The tower had been dismantled and packed in a 40-foot shipping container. 2012: The lower half of the tower was re-erected at the Homestake Ranch in Northeast Wyoming where a wood frame cab was added. The top half to be erected at the same land owners property in Minnesota. November 10, 1964: "Bill Lawrence, Nash County Forest Ranger, today announced a new telephone number for the Swift Creek Fire Tower. May 6, 2010: An electrical caused fire broke out in the tower cab when workmen were installing new equipment in the unused tower. July 30, 1957: "Valuable radio equipment has been stolen from the fire tower near Cleveland in Rowan County, R.G. Carney, county forester, said today. Carney said Rowan county officers are investigating the break-in which was discovered earlier this week. 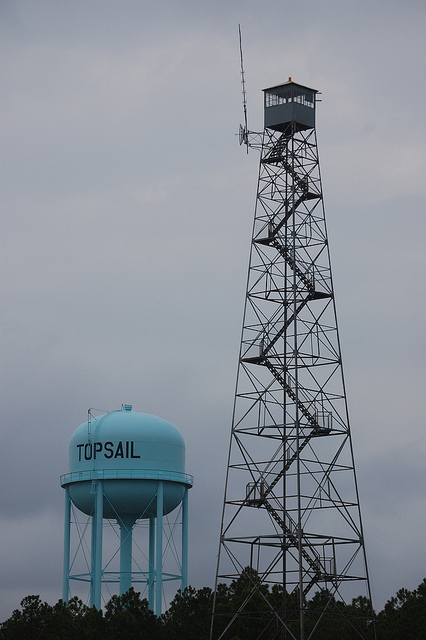 The forester said the tower, which serves parts of Iredale and Rowan counties, was not manned except during the danger seasons and it was impossible to determine the actual time of entry. However, Carney said, all indications point to a recent break-in. Carney said the lock was prized and broken, and only the radio equipment was taken. Other equipment was not tampered with, he said.